I really wanted to read Hello, I Love You. The cover is beautiful, the concept was super intriguing, and I’ve basically only read fantasy so far this month and wanted to cleanse my palette. This book is about Grace Wilde, country girl and daughter of super famous music producer, who runs away from her troubled path to go to school in Korea. At school she meets bad boy Jason, lead singer of KPOP group Eden. The story starts with a letter to her Big Brother, and from that very moment I guessed what Grace was trying to hide from everyone. I don’t know if it was supposed to be obvious – it certainly wasn’t a surprise when her backstory was leaked – but it did build the tension for the characters, if not the actual readers. I was totally drawn in by the first quarter of the book. The description of Korea and the sensory experiences was excellent, and it was really great to be introduced into a different culture. I suppose this aspect is why this book is compared to Anna and the French Kiss by Stephanie Perkins, but apart from being set in a foreign school the similarities end there. Grace was a somewhat likeable character; I’ve read daughter-of-a-famous-guy before so already knew what I was getting into, but she wasn’t a complex character. I didn’t understand what her problem with Jason was. Why was she always on his back about being a celebrity, when she was hiding from being one herself? I thought she was rather hypocritical at times and extremely overdramatic. She never let him explain himself, and didn’t bother to stick around when he actually tried to. Unfortunately Grace was a very fickle friend and throughout the whole novel I just kept thinking: you can’t choose what aspects of someone you’re okay with! I really couldn’t relate to Grace because how she reacted to certain situations was the opposite of how I would react. Jason was just as bad at times, and I think this story would’ve been greatly enhanced if it swapped between Jason and Grace’s perspectives, because I couldn’t get a handle on him! He was seemingly nice one minute and arrogant the next. I’m not entirely sure that this was explained by the end of the novel, and all was forgiven for the sake of romance. Grace and Jason’s whole relationship was toxic. The heart may want what it wants but there should be an I’m Out Clause, because Grace definitely needed one. She couldn’t decided how many second chances she was going to give. If I was Grace I would’ve extended the hand of friendship and nothing else, especially considering he messed her around a lot. Talk about mixed signals! 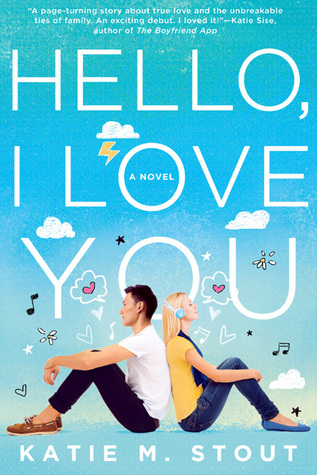 Despite all this Hello, I Love You felt like a guilty pleasure read. I may not have particularly liked any of the characters – except Yoon Jae, but apparently Jason hated him on principle, which makes literally no sense. You can’t hate someone just because they’re talented at things you’re not – but I did enjoy the overall feel of the book. It’s no secret that I love a good love/hate relationship and Hello, I Love You but Grave and Jason were ridiculously frustrating. Grace was obviously in love with him, but whenever they started to get close she’d pull away and give him the cold shoulder. Her argument about why she was getting to angry was weak. I may enjoy love/hate relationships, but I really can’t stand when characters can’t admit their feelings to themselves. All of the adventures that they got to have in South Korea were really fun to read. I loved how the author included all of the different foods and you could totally tell that she’d done her research. The school system is so different to what we have in the UK I was also really interested in those elements, even though we were never in the school for very long. The pacing was quite slow and cyclic, but eventually it did pick up and Grace became a more 3-dimensional character. As I said, the ending was completely predictable, as were all of the characters motives for loving/hating each other. Overall, Hello, I Love You wasn’t much of a surprise, but getting frustrated at hormonal teenagers who just can’t seem to work it out was exactly what I needed after my fantasy kick. The setting is what sets this book apart from the other contemporaries out there. It’s a quirky summer read, and I’d recommend it to contemporary lovers, even though I only gave it 2 stars.